There are two significant paintings in my office, framing the room like two solid bookends. One faces east, the other west. One describes Aboriginal desert life, the other offers an image of a refugee family. They represent the beauty and fragility of life and the ongoing and largely unfinished business of this country — welcoming the gift of our First Nations Peoples and of those who come as refugees. Flight into Egypt, by Louis Kahan. The painting of the refugee family is titled Flight into Egypt and is by Louis Kahan. 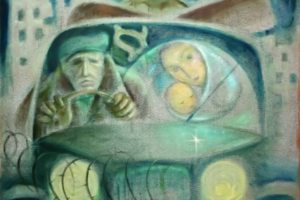 Painted in 1952, it represents the Holy Family in a modern context. Joseph is driving a car at night through a barbed wire enclosure. Mary is shielding the sleeping child with her shawl. The tools of Joseph’s carpentry trade are evident as they drive out of the city. There is a faint image of Australia in the right headlight. As I sit between these two paintings, I am struck by how our nation’s celebration of Christmas sits within key meanings of Australian life. As they can represent the bookends of rejection, they can also represent the bookends of a gift within the framing of a richer Australian story. They invite us to pause, welcome and receive. Each year Christmas comes within its own Australian context. This can be, for many, a long way from the snow, reindeers and tinsel of others’ imaginations and Christmas celebrations. This year, for example, we will be more mindful of those in Queensland who recently have suffered the heat, loss and impact of bushfires. As Christmas can bring us closer to the living reality and gift of all God’s people, it also can also reveal God’s presence among us. At the heart of the Christmas story is God’s deep affection for us. God made welcome our human family by entering fully into it, coming as a child. And sadly we learn it does not take long before he, like so many others before and after him, finds himself without a home and as a refugee. As we give thanks for this year and prepare for the coming celebration of Christmas, let us welcome a holy space within our hearts and families that allows Jesus to enter; to come and settle within our hearts and lives. And, in welcoming him as Emmanuel, God-with-us, let us allow ourselves to become more open and welcoming of others. We might allow them to come into our imaginations, hearts and homes. We might, in turn, seek to be graced and know how much God wishes to be with us and, in very special ways, with those who invite us to pause, welcome and receive. A rich, blessed Christmas to all this year as we give thanks for the company, life and mission we share in our Australian Province, and more broadly in our Asia Pacific Conference and across the whole Society of Jesus. A personal thanks to all who have paused, welcomed and received me this past year. May I offer a hopeful prayer for our journey ahead as Australians that we may treasure the gift we receive in those we welcome into our hearts and lives.